Classical survival is a must to give a visual pleasure, you should enjoy the scenery around you, wander around the surroundings and admire the natural formations and landscape. 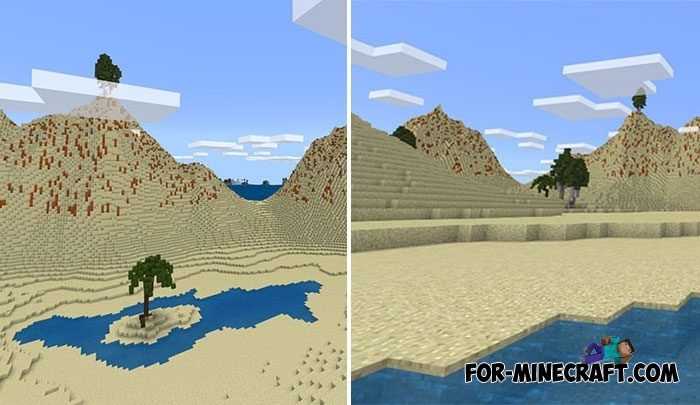 Unfortunately, the generation in Minecraft Bedrock Edition is not developed enough to create so beautiful and natural places like this. You will appear on an island that looks much better and more realistic than the standard ones. Sandy beaches, sea water and small mountains will be excellent components for the construction of a small house on the beach. In addition, the recently released MCBE 1.4 that brings a lot of marine content. Those features fill the ocean with new opportunities for you and new mobs will become a company for you.